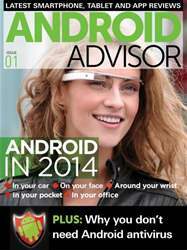 Download the first issue of Android Advisor FREE! Welcome to Android Advisor, a digital magazine devoted to devices running Google's mobile OS - and not just phones and tablets. Check out our analysis of Google's plans to standardise in-car technology, our assessment of the health-, safety- and security risks of Google Glass, and our first impressions of Sony's SmartWatch 2 and Samsung's Galaxy Gear. We also round up the best apps built for the Android operating system, including a look at the state of Android antivirus and the best apps for shopping and photography. If you're new to Android from iOS we'll explain how to transfer your iTunes library to Android. Other tutorials include setting up a tablet as your office PC, how to use BBM on Android, how to call premium-rate numbers free from your mobile, and how you can continue enjoying your Android apps on a PC. Android now accounts for 32 percent of the entire PC market. Although PC shipments passed one billion units for the first time last year, 2013 was certainly the year of the budget tablet. Check out our reviews of the ultra-cheap £119 Tesco Hudl, as well as Google's Nexus 7 and the 7in Kindle Fire HDX. 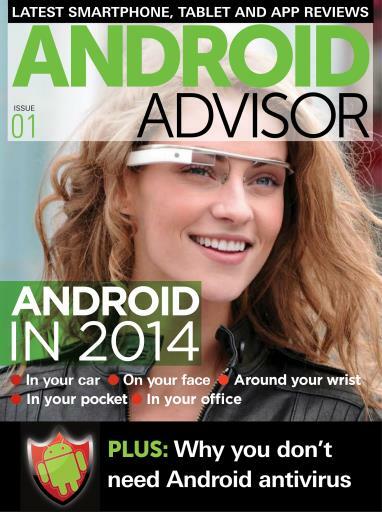 Plus we've got smartphone reviews covering everything from the LG G2 and Nexus 5 to new value entries in the form of the Motorola Moto G and ZTE Blade V.
Don't miss out on the first edition of Android Advisor!